Published 1860 by The London Printing and Publishing Company come these interesting engravings, from an era that could be considered the Golden age of England’s fascination with Scotland and the Scots, especially amongst London Society (thanks to Queen Victoria’s period of mourning and HRH’s purchase and withdrawl to Balmoral Castle. These aforementioned factors may have contributed to the following work. The wonder of the highlands and it’s wilderness, the Society dress of our Lady, the hunting with deerhounds, the morbidity of death and, including a touched upon aspect of history with the mention of the Forty-five and Prince Charles Edward Stewart. View the printed art plates read the excerpts and form your own opinion but most of all . . . enjoy! THEY who have had a favourite dog—and who has not? who have felt the solace of his mute sympathy in affliction, and the animation and gaiety which his gambols throw around our happier hours, will not disdain to participate in the grief of the humble family of Angus Cameron, as they gazed upon the faithful creature, who, after lifting up his head, and looking in his master's face for the last time, sank patiently down, and, whilst poor little Jeanie flung herself beside him, stroking his stiffening neck, and mixing her fast-falling tears with the life-blood that dabbled his shaggy coat, stretched out his limbs, gave two or three convulsive twitches, and died. 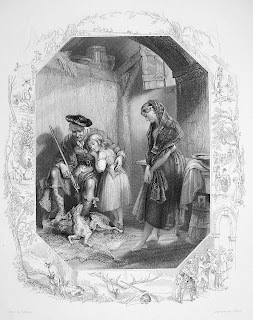 Jeanie would not believe that Luath was dead, and even her grandfather, although contradicting her assertion that he still lived, with the irritability of sorrow, deepened by indignation, raised the body of his favourite, with a half hope that life was not extinct, and when it fell back a heavy weight upon the clay floor of their cabin, broke into bitter denunciations upon the cowardly tyrant who had slain, in wantonness of anger and power, the best and bravest dog that ever trod the braes of Glendorroch. The peculiar circumstances of the people and the time lent a double force to the old clansman's malediction. It was about twenty years after the Forty-five, in which unhappy insurrection the chief of that branch of the Camerons, together with many chieftains of that brave and ancient house, had adhered to the last to the fortunes of Charles Edward, had been attainted and forfeited, and had died broken-hearted and in exile. His only son, too young at the time of the rebellion to partake of his father’s guilt (the old retainer did not give that name to the part his leader, Glendorroch, took in that remarkable rising), was deprived of his inheritance, whilst the large property from which he derived his territorial title was bestowed upon a Campbell, the sworn enemy of the clan, who had intermarried with a distant kinswoman of the Camerons. He, too, was dead, leaving only a daughter, reared and educated in England, whilst an Englisher, or, at the best a lowland Scot, an Elliott of the debateable land, was placed by the Campbells, her father's kindred, as agent, looker, factor (whichever was the obnoxious word for a most obnoxiotis office), over the estates and vassals of the young heiress. He it was, a keen sportsman, and a hot and fiery man who already deeply unpopular amongst the clan, with whose language and manners he was anacquainted, and whom he at once mistrusted and despised—he it was, this very Gilbert Elliott, who had now filled up the measure of his sins, by shooting Luath. Sometimes we just post for little more reason than the discovery of deerhounds featured in an illustration. 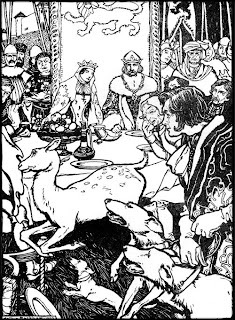 Here we have an illustration from an online free clip art website, featuring King Arthur at the feasting round table, viewing a poor deer, given what appears to be little chance in the chase. A crowd of court onlookers, two hounds and one small tarrier, harrying their quarry - hopefully, prior to it’s release - for the deer to be afforded a sporting chance. 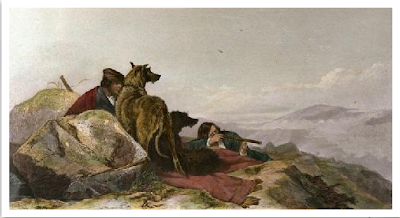 This rendering seems to feature a less than gallant slant on the hunting activity but the original art source which is likely to be a book illustration is not credited, nor does it feature any descriptions or book references. But the hounds make it of interest here - view and enjoy. Today deerhounds, lurchers and a selection of little hounds enjoyed another great day of fun running at Rumbling Bridge, and although the Rogue couldn’t attend following a puppy training injury, it was left down to the Rascal to run his best as a substitute courser. A video featuring some of the events action will be posted here soon, but in the meantime - enjoy these pics. And if you wish to enjoy more photographs, follow this link to Showgirlie’s photobucket who has also posted some excellent images (The shot included here below featuring oor Rascal running, being one of them). Don’t forget the next meeting: Sunday the 5th of April at 11am. 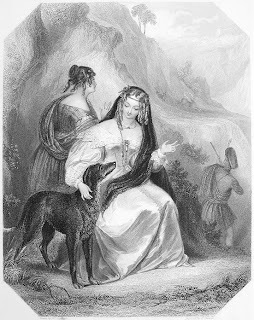 Another Friday the 13th, and, although we are primarily Scottish Deerhound Bloggers here at Rogues blogspot - every now and again some noteworthy historical event that may be of interest to Scottish Deerhounds the world over, sneaks onto our blog. On this day in 1395, John Barbour, the Scottish Poet died. He is considered the first major literary voice to write in Scots, the vernacular language of Lowland Scotland. Read and enjoy both works by following the relevant links! Looking for somewhere to go this Sunday? What’s this? Hounds lost in the mountains of Perthshire? 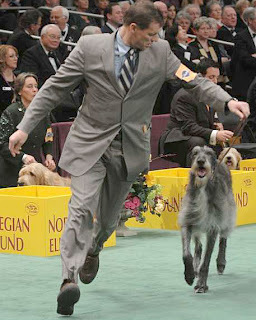 What, with a Scottish deerhound, named after a player, named after a big cat (from that Scottish creation for the ruination of a good walk, Golf), winning the US Westminister dog show hound group category - let’s see how we fare in the UK at Crufts. Watch crufts here today on crufts telly or visit their you tube site here and good luck to all the hounds who attend. Todays picture below was culled from the LA Times - follow the link to read the article and our comments. Hello Tiger! 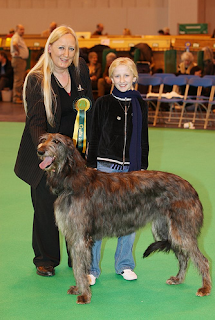 Hi to all Welsh Deerhounds and a happy Patron Dewi Sant day. It’s also Saint Monan’s Day in Scotland for those who know, or follow their Saints. And for us today, here are some wee photographs taken when we traveled back in time exactly 244 years and left our Box Brownie at Nicéphore Niépce’s parents home. But these do look like they could be the product of Nicéphore Niépce, don’t you think? We know Nicéphore’s birthday is not for another week but we are deerhounds and we might just forget to wish him happy birthday next Sunday. So here it is one week in advance . . . Happy Birthday Nicéphore and thank you. Look where photography is today.